Giada Gramanzini moved back to her parents’ home in Naples last year while looking for work. Jobless young people are driving the antiestablishment political shift in Europe. A youth revolt is upending Italian politics, and it could be a harbinger of things to come. Western Europe’s largest antiestablishment government came to power earlier this month, driven largely by young Italian voters. Struggling with a persistent lack of job prospects over the past decade, they voted in droves for two parties in the country’s March 4 elections, the 5 Star Movement and the League, an anti-immigration party. 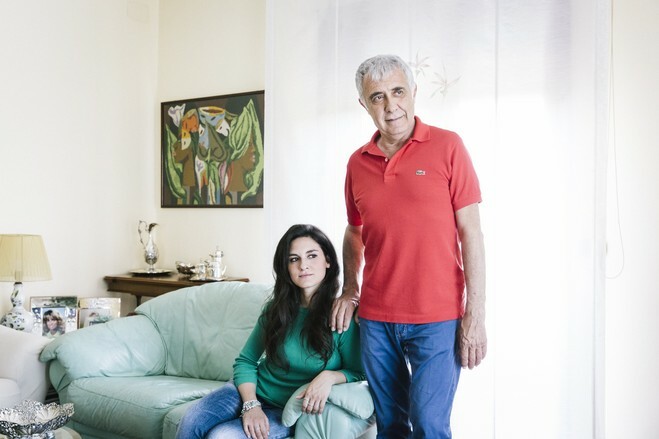 The result laid bare a stark generation gap, with older Italians, who often have to support their grown children, continuing to vote for mainstream parties. The same pattern appears across southern Europe, and the forces behind the divide show few signs of slowing. Almost 30% of Italians age 20 to 34 aren’t working, studying or in a training program, according to Eurostat, more than in any other European Union country. 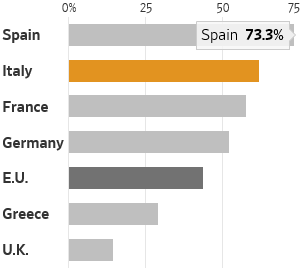 Greece is second at 29%, while Spain’s rate is 21%. “Italy is collapsing and yet nothing has changed in this country for at least 30 years,” said Carlo Gaetani, a self-employed engineer in Puglia. Ten years ago, when he was in his early 20s, he voted for a center-left party that he hoped would push for economic development in southern Italy. When Italy descended into a crippling recession, he felt betrayed by the traditional Italian left-wing parties. He has seen friends struggle to find jobs, and said his own business opportunities are limited to the stagnant private sector, because commissions for the public sector are usually awarded to people with connections he doesn’t have. Mr. Gaetani, now 33, voted for 5 Star in the 2013 election, a choice he repeated in March with more conviction. “5 Star is our last hope. If they also fail, I think I’ll stop voting,” he said. Younger adults who do find employmentmust often accept short-term contracts. *Generally lasting one year or less. 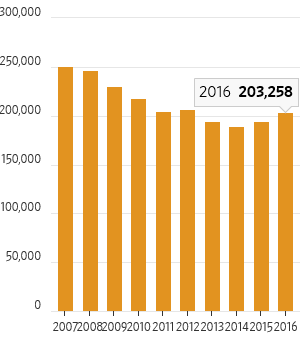 The employment rate of Italians under 40 fell every year from 2007 to 2014 before flatlining over the past three years, according to Eurostat. Meanwhile, it has risen every year for those between 55 and 64 years, in part due to an increase in the retirement age. 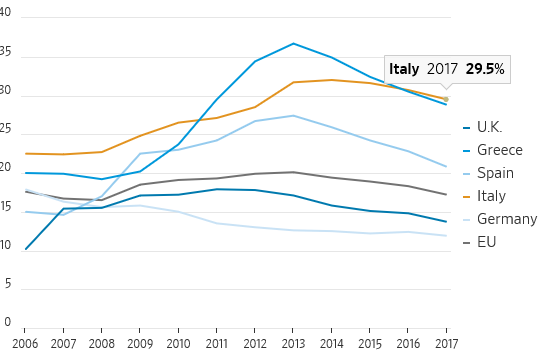 The number of Italians under 34 in absolute poverty—defined as being unable to afford basic goods and services—more than doubled between 2010 and 2016 to 10%, according to the Italian National Institute of Statistics, or Istat. For those over 65, it dropped to 3.8% from 5.4%. One major problem in southern Europe is a dual employment system in which people with open-ended contracts—often older workers—enjoy ironclad job security and benefits. At the same time, during the downturn, employers began to use more short-term contracts, generally lasting from one month to a year. In Italy, 62% of contracts for those under age 25 were short-term in 2017, up from a quarter in 2000. Italian policy makers introduced the contracts in the 1990s in part to help young people enter the labor force as a step to permanent work. Employers used them to avoid the cost and hassle involved in firing people. 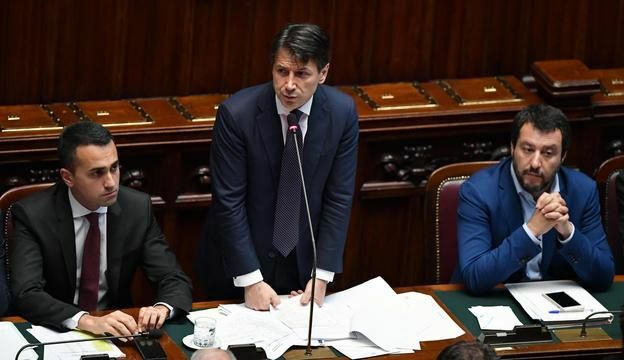 Echoing labor overhauls elsewhere in Europe, Italy introduced a major revamp of work rules in 2014 and 2015 that tried to get employers to use more open-ended contracts, including billions of euros in tax breaks. The most generous breaks expired in 2016. In Southern Europe, younger adults are still struggling a decade after the financial crisis hit. The efforts didn’t have the desired effect of creating structural change to the labor market that would wean employers off using short-term contracts. In 2016, when the tax breaks were in place, only 13% of new hires were on short-term contracts. Last year, more than four out of five new hires were on short-term contracts, according to Istat. The 5 Star Movement has lured millions of young voters with promises to roll back new labor rules, give the unemployed and poor a so-called universal basic income of €780 ($905) a month, and abolish unpaid apprenticeship contracts. Its leader, Luigi Di Maio, was a 26-year-old university dropout who lived with his parents when he was elected to parliament in 2013. Today, he is a deputy prime minister. The League also made canceling the recent labor revamp a central part of its electoral platform. Matteo Salvini, the leader of the League who became a deputy prime minister and interior minister in the new government, promised to return hundreds of thousands of migrants to their countries of origin. 5 Star, which straddles the line on many issues, spoke of stemming illegal immigration, but stopped short of calling for mass deportations. About 53% of Italians under 35 voted for the two parties combined, according to an Ipsos poll. About 43% of Italians over 65 voted for legacy center-right and center-left parties, while only 28% of young Italians did. Elsewhere, almost 40% of Spaniards under 35 said in an April poll they would vote for far-left Podemos and its political allies in a coming election. In Greece, more than 41% of those age 18 to 24 voted for Syriza in the 2015 election, six points more than the antiestablishment party got across all age groups. Argyro Maltasoglou, 30, said she voted for Syriza in the 2015 election because she thought the upstart party would make radical changes, especially in terms of policies to help young people. Since graduating from college in 2013, she has been bouncing between short-term contracts lasting less than a year. She has been looking for a job since her short-term contract as a secretary in an Athens hospital expired in March. One exception to the generational phenomenon is the U.K.’s 2016 vote to leave the EU: 71% of voters age 18 to 24 voted for the country to remain in the bloc, according to a poll by YouGov. Only 26% of those 65 and over voted to remain. Studies following the Brexit vote showed that, in this case, young Britons valued the increased ease of working, studying and traveling abroad that EU membership brings. At the same time, many older voters viewed leaving the EU as an opportunity for the U.K. to better control immigration. The pain in southern Europe reflects a feeling across much of the Western world that the younger generation will struggle to surpass their parents in wealth and security. Half of Italians who responded last year to an online survey on jobs site Monster.com said they thought they will earn less over their careers than their parents. Young Italians, who bore the brunt of the country’s protracted, triple-dip recession, still bear the scars that will affect their career prospects, homeownership and birthrates for decades to come. Banks are reluctant to lend to people on short-term contracts, which has helped push up the average age of home buyers to 41.6 years in 2017 from 39.4 years in 2012, according to Fabiana Megliola, head of research for real estate group Tecnocasa. In 2017, 56% of home buyers in Italy were under 45, down 10 percentage points from five years. The number of Italians getting married has fallen by a fifth over the past decade, according to Istat. In 2016, the last year for which data are available, Italian men got married on average at age 35 and women at 32, in both cases two years later than in 2008. Births hit an all-time low last year. In Italy, economic woes have led many youngpeople to live with their parents and hold offon marriage. In a country with strong family ties, parents are stepping in to help adult children. They can often afford to help because they enjoy pensions that are the fruit of decades of generous retirement benefits. 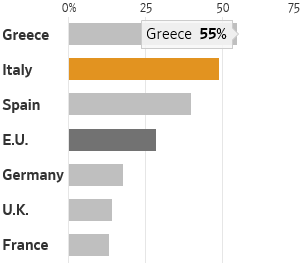 Italy spends more than 15% of its economic output on pensions, the most in Europe except Greece. About half of Italians age 25 to 34 live with their parents, according to Eurostat, almost double the European average and more than in any other Western European country. The number has risen 3 percentage points in the past decade. And more than a third of Italians in their 30s get economic help from their parents or grandparents, according to a survey by agricultural industry association Coldiretti and polling firm Ixè. Parties such as 5 Star could continue to win over more young voters if they are able to enact some of the pro-youth policies its leaders campaigned on. “I’m not interested in politics because nobody on either side [of the political spectrum] is doing much to help young people,” said Giada Gramanzini, a 29-year-old Italian university graduate. She hasn’t found a steady job since deciding not to renew a three-month contract as a full-time receptionist that paid her about $2.70 an hour. Last year, she moved back in with her retired parents and sent out more than 70 resumes before moving to New York last month to try her luck in another country. In the March election she voted for a small pro-European party, in what she called a protest against the Democratic Party—the center-left party that ruled the past five years. She didn’t feel 5 Star was ready to govern. Her father, Emilio, collects a good pension after working most of his career for the Naples municipal administration. Her mother, Daniela, began working full time at 20 and was employed by the city for several decades. She retired last year. Daniela worries about the late start Giada is getting on adult life. “How can you not be worried about your daughter if at 29 she still hasn’t found her way?” she asks. —Nektaria Stamouli and Jeannette Neumann contributed to this article.